This extremely rare port from the excellent 1944 vintage is tawny coloured and is smooth and mellow with a long rich finish. Drink now - 2023. 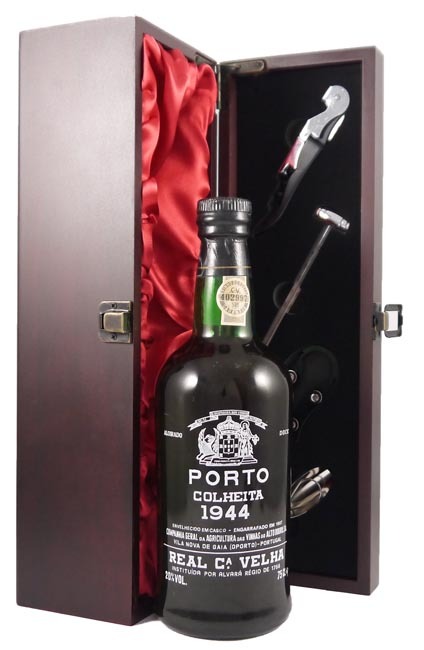 This vintage port is shipped in a deluxe silk lined wooden presentation box with four wine accessories (corkscrew, wine pourer, drip stopper & wine thermometer) [worth £17.99] at no extra cost and now includes a free gift card with your personal message and tasting and storage notes. .